BUENOS AIRES, Apr 16 2013 (IPS) - Gated residential communities on the Paraná Delta have sprawled out of control in recent years, and are plugging up the local ecosystem and preventing the natural runoff of water that cushions the impact of floods in a vast area near the Argentine capital. The problem was particularly highlighted after the tragic flooding in early April in the city of Buenos Aires, and especially in La Plata, the capital of the province of Buenos Aires, where torrential rains caused the death of almost 60 people. The real estate construction boom, the lack of infrastructure such as storm drains to cope with increasingly frequent and heavy rains, and the lack of contingency plans in response to disasters are now at the centre of debate in Argentina. The Paraná river delta is an immense wetland covering 17,500 square kilometres in the lower course of the nearly 5,000-kilometre long Paraná river, which divides into a labyrinth of smaller branches before flowing into the Río de la Plata estuary. Traditional houses on the islands of the delta are built on stilts, have wooden jetties and are surrounded by reed beds. They coexist harmoniously with an ecosystem that is prepared periodically to receive large amounts of floodwater. It is an area of high biodiversity which also provides many environmental services. The most outstanding are provision of water and the capacity to regulate the river’s floods, which are becoming more frequent and intense due to climate change caused by global warming. In recent years, however, 229 housing developments of different sizes have been built on the floodplains of the delta, most of them with luxury homes, golf courses, tennis courts, shopping centres, schools and horse-riding centres. Town planners said that about 90 percent of these developments were built on floodplains subject to overflow from rivers and streams, and 10 percent on silt islands that were artificially levelled or filled in to support the residential complexes. Daniel Blanco, the head of Fundación Humedales (Wetlands Foundation), told IPS in an interview that the building expansion was “very aggressive.” Now the area is at risk of losing its natural capacity to absorb water, just as storms are becoming more intense. Experts with the NGO, which works for the conservation and sustainable use of wetlands, say that under the false pretext that the land is unproductive, real estate projects went ahead with levelling, draining and diverting water courses, affecting the natural functions of the wetland. “They are trying to convert the place into a dryland system,” complain the authors of “Bienes y servicios ecosistémicos de los humedales del Delta del Paraná” (Ecosystem Goods and Services in the Paraná Delta Wetlands), a study that warns of the risk of flooding in adjacent areas. 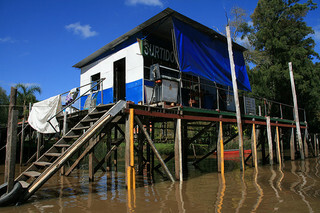 The study, by Patricia Kandus, Natalia Morandeira and Facundo Schivo of Fundación Humedales, indicates that the delta ecosystem does not prevent flooding, but cushions the rise of the river level, retains part of the volume, filters the water and releases it slowly thanks to its plant cover which acts like a sponge. Warnings from environmentalists and local residents, added to the severe impact of heavy rains in the Buenos Aires metropolitan area, managed to block some investment projects, and have led to progress in regulating new building on the islands. One of the projects brought to a halt is Colony Park, which promised “a private island of peace and tranquillity” on 300 hectares of the Delta del Tigre, the lowest-lying section of the wetlands, in the northeast of the province of Buenos Aires. According to its promotional advertising, the building of 1,000 “luxury” dwellings was planned. Due to the controversy generated by the project, as well as a lawsuit brought by residents, in 2012 the municipality of Tigre with the help and expertise of environmental organisations drew up stricter planning regulations for building on the islands in that district. Acknowledging the fragility of the delta ecosystem, the new regulations require buildings to be constructed on stilts, forbid the alteration of the natural elevation of the islands – which usually grow by accumulating sediment – and ban artificial filling in of the centre of the islands. The islands of the delta are normally bowl-shaped, with a hollow in the centre that contributes to retaining excess floodwater. But these hollows were being filled in to raise the elevation and avoid flooding the building site. In Campana, another municipality of Buenos Aires, a local association, Vecinos del Humedal, got a temporary stay against a residential development planned for 40,000 people on the Luján river, one of the delta tributaries. Alejandro Fernández, a member of the association, told IPS that local people got together to resist the project in their area, where several gated communities are already causing flooding in the surrounding areas. In late October a heavy storm caused the level of the Paraná river to rise by nearly five metres, creating severe flooding not only along the riverside but also in the centre of the city of Luján, where the floodwater reached the basilica, an international tourist attraction. “All along the Luján river, the building of private complexes has been allowed on the floodplains that alter the natural ebb and flow of the river. If they cap a virtually flat area with cement, they create a serious problem,” Fernández said. “Then when the floods come, political leaders clutch their heads, but they were the ones who signed off on the permits for those real estate projects without proper urban planning,” he said.